Spring is well and truly sprung with new children’s theatre show GROW – a curious, mellow and playful springtime adventure for wee ones between 3 and 5 and their families and carers. It’s the first day of spring and tiny tendrils of new life are peeping out of the ground, stretching their way into the sunshine and into a riot of glorious colour. The 35 minute show includes an improvised free play session involving the audience. GROW is by Indepen-dance 4, the company that created the award-winning Four Go Wild in Wellies. Bring your phone or tablet to the Community Hall on a Tuesday morning at 11am and have a cuppa whilst sharing hints and tips with each other. We all use our gadgets for different purposes, so we can all learn from each other. Please note that Click & Coffee is NOT a class, it’s an informal get-together allowing everyone to help each other. Suggested donation of £1 for refreshments. Fabulous prizes and experiences to be won. All proceeds to Boat of Garten Community Hall. Boat of Garten has hosted an annual auction sale of second-hand goods for over 30 years. The auction sale is a key fundraiser for the community hall, with funds used for running and upkeep of the hall as well as providing community groups with fabulous accommodation. Originally set up for the old Village Hall, the auction was typically held on the last Saturday of August, and has proved so popular it has become one of our main fundraising events of the year, alongside our Hogmanay Ceilidh. With the increasing popularity of the much-loved Thunder in the Glen in August, this year we’ve moved our Auction to Saturday 4th May. Donations of second-hand goods can be made to Boat of Garten Community Hall in the weeks leading up to the big day, with collections of the larger items being arranged on the evenings of Thursday 2nd and Friday 3rd May. The sale itself will follow the same schedule as always: viewings can be made on the Friday evening, and from 10am on the Saturday before the Auction begins at midday with auctioneer Rod MacKenzie. In order to embed the new date in people’s minds, we’re also going to run an online auction from 27th April to 3rd May, whereby we’ll be auctioning items donated by businesses or individuals to help raise awareness of the event, as well as a little extra funds. BOAT ONLINE AUCTION: Prizes will be announced daily at midday from Friday 12th April to Thursday 26th April, with bids being taken from 27th April to 3rd May. Please use the link below to browse through the prizes, being sure to check the terms and conditions, and then click on the link to submit your maximum bid for the prize that takes your fancy. An update on bids for each item will be given on Wednesday 1st May, letting you judge whether or not you’d like to increase your bid before bidding closes at midday on Friday 3rd May. Winners of each item will be notified on Friday 3rd May, with prizes available for collection at Boat of Garten’s Auction Sale on Saturday 4th May or by arrangement if you can’t make it on the day. Boat Online Auction | 27th April – 3rd May 2019 | Prizes to be won! Happy Bidding – May the 4th be with you! The installation of picnic tables into Boat of Garten Station Square comes towards the end of a long journey developing the area, transforming it from a dreary space of old and broken tarmac into the destination it is today, enjoyed by both local residents and tourists in equal measure. Boat of Garten Community Company embarked on the project many years ago, village residents were invited to vote on their preferred interpretation for the area and the scheme was enabled with money from CNPA and the Scottish Government. It is almost complete – just some signage and an interpretive story still to come. The overall theme was to furnish the square with interpretive elements reflecting the railway heritage and complementing the listed station buildings. This process started off with the involvement of two local artists – Sheena Wilson who came up with the original concept ideas, and Christine Morrison who designed the installation of the artwork depicting letters and postcards received in the village – based on real material, which was collated via a workshop with local people who searched through their attics to unearth these old letters. There was a competitive tender carried out for all the major works, based on the concepts which had been agreed, and this was won by Michael Job of Black Ox Arts. He provided both the inspiration, fabrication and installation of all the interpretive elements in Station Square – including the emblematic Osprey Feather and the latest installation, the bespoke picnic tables. The Feather itself is constructed by bending an old rail track, donated by Strathspey Railway, and the picnic tables and benches are constructed using railway sleepers and bent railway track for the supporting legs. Michael has inset the letter and postcard artwork into the wooden surfaces of the tables and benches – these were originally inset into the tarmac road surface, but the friction of vehicles resulted in them becoming dislodged, leading to the alternative plan of installing the plaques into the table and bench surfaces. The idea of letters and postcards from a bygone time was another idea which came from the very imaginative brain of Michael Job! Another sculpture he fabricated for Station Square was that of a horse and cart, which met the train and collected the mail – but a mailbag on the cart has opened up and the letters have blown up the road! That is why they were originally set into the road surface. We are very excited to introduce a new activity at the Boat Hall. After many requests, we approached a number of people about the idea of starting an “all abilities, fun, singing group”. We are very pleased that Ann Napier, Alan Gristwood, Amy Taylor, Denise Robertson and Mark Holroyd have all agreed to help bring the group together. 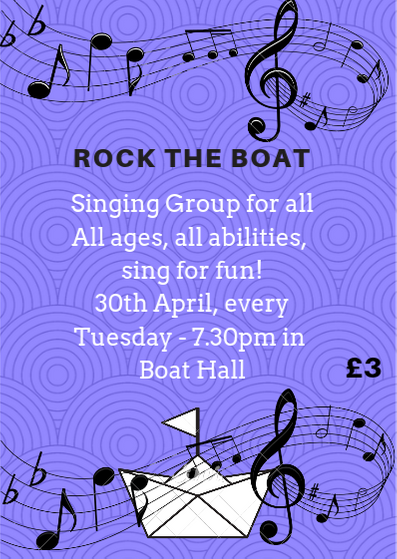 The intention is to create a group session for people of all ages and abilities to have the opportunity to “belt out your favourite tunes” in a fun environment. Everyone is welcome to come along and sing like you sing in your car! We will be running a 6 week taster session starting 30 April at 7.30pm. No need to commit to the full 6 weeks. Just come along to as many sessions as you like. Hall in Seoul, Laeiszhalle Hamburg in Germany, Durban City Hall in South Africa and Palau de la Música in Barcelona – not to mention, of course, Boat of Garten where he is a firm favourite with TOMS audiences. When Nick is unceremoniously dumped by his girlfriend Caitlin at their university graduation, he vows to spend the summer confined to his bedroom. His best friend, Shane, a guilelessly optimistic EDM obsessive, convinces him that the best way to get out of his head – and over Caitlin – is to attend a music festival. Just after midnight, a snowdrift stops the Orient Express in its tracks. The luxurious train is surprisingly full for the time of the year, but by the morning it is one passenger fewer. An American tycoon lies dead in his compartment, stabbed a dozen times, his door locked from the inside. Isolated and with a killer in their midst, detective Hercule Poirot must identify the murderer – in case he or she decides to strike again. King of Thieves is the incredible true story of the spectacular Hatton Garden diamond heist, the biggest and most daring in British history, humorously told through career best performances from a stellar cast. What starts off as their last criminal hurrah quickly turns into a brutal nightmare due to greed. Based on infamous true events.